For those of you who haven’t heard, Oh My! Handmade Goodness is adventuring through the summer with a creative business camp. This month, the Camp OMHG Merit Badge design challenge started and today the first set of merit badges were offered. I submitted six different badges to the challenge, while also experimenting a bit with Photoshop. Maybe you need to learn some new photography skills for your shop, or maybe you’ve selflessly taught a new skill to someone in need. Have you helped a friend, sewed something, conquered a challenge, or built a new website for yourself? You can download and print these badges over at OMHG along with some other very fun badges from other designers. 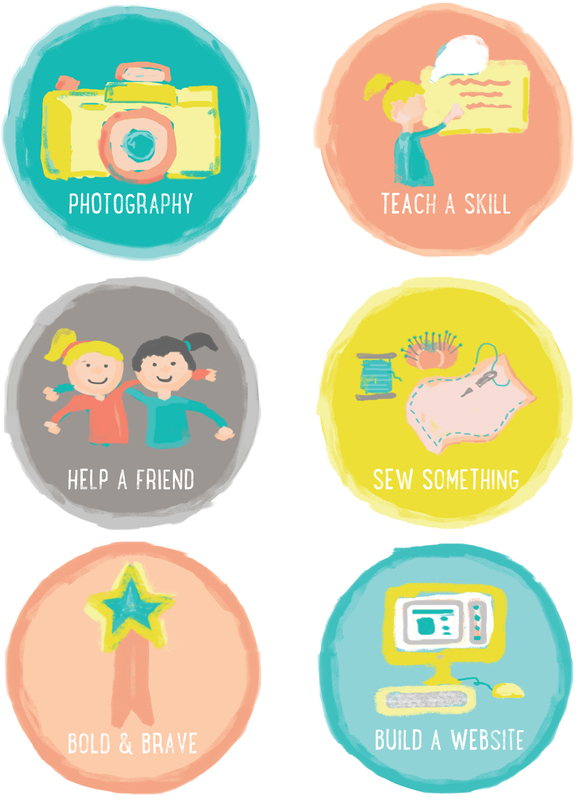 I’m hoping to earn the teach a skill badge, the help a friend badge, the sew something badge, and the bold and brave badge. I have a lot of goals that are going to require me to be bold and brave! I’d like to know, what is it that you would like to accomplish this summer? Do any of these badges work for your goals, or is there something else you had in mind? I love that you included “sew something” and I’m determined to get you stitching!! Hope you had a great 4th and are enjoying some cool-er weather! Jenelle – I know! I want to get stitchin' too! 🙂 The weather actually was amazing today…it started raining around 2 and dropped to 70 degrees! I hope you had a fun 4th too! Your badges make me smile every time & I bet you have already earned your Help A Friend badge a few times over this summer! Jenelle-want to host a sew-along in the forums to get us non-sewers sewing? I bet we could wrangle Karen to co-host. Getting on a calendar for us now! Thanks Jessika! I sure do try to help whenever I can! Although, I feel like more of the OMHG is helping me instead! You are all so wonderful. Ooooo….a sew along sounds fantastic!